#5A: In their effort to understand the observable universe, scientists believe many assumptions are unnecessary. These include postulating 1) the existence of God, 2) the universe had a Creator, 3) there is an intelligent design or meaning behind it, 4) God and His agents can work miracles, and 5) vital spirits and souls are associated with living things. So these have no place in astrophysicists' Big Bang Theory, in their accounts of roughly nine billion years of physical evolution that preceded formation of the Earth 4.6 billion years ago, nor in biologists' theories of the origin of terrestrial life nearly four billion years ago and its subsequent evolution producing such diversity of living things. In collecting the data from which his theory of evolution emerged, Darwin was especially interested in beetles. Entomologists have now described over 350,000 different beetle species, and millions more are believed to exist. Why so many? Those who understand key concepts behind evolution, most notably random mutations, natural selection, and geological time, have little difficulty providing an explanation. But why would God make so many of them? For centuries scientists have looked for signs of intelligent design, proof of God's hands at work, etc. While they recognize their framework is still evolving, as Nobel Prize winning physicist Leon Lederman puts it, "The space available for God seems to be shrinking." Scientific materialists and vitalists differ most fundamentally over what life is. The former most basically require that living things be able to make copies of themselves (replication), use matter and energy to regulate and sustain themselves (homeostasis and metabolism), and repair errors that may arise in their genetic or metabolic related structures. Some extend that definition and require living things be made of cells and they be able to reproduce and metabolize on their own—not through the hijacking of some other organism's cellular machinery. In contrast to such modern science conceptions of life, those buying into vitalism build their definitions around the idea that living things possess a vital spark, life force, or spirit. Scientists have looked for a spiritual component to life: comparing the weight of living things and dead corpses, investigating such things as out of body experiences, near death experiences, reports of auras around faith healers, séances in which mediums make contact with the dead, and a wide range of paranormal experiences. The consensus is no convincing evidence for it exists. Some feel human spirituality exists only in the mind. Indeed, researchers have triggered intense feelings of spiritual transcendence using electrodes to stimulate certain regions in the brain. At Harvard, they've built a model of what they think the first cell was like. Others expect to create life in the lab some day soon. Want a recipe? See Figure #5a! #5B: Just as scientists struggle to define life, vitalists have different conceptions of what spirit is. Some conceive of it in a way that is potentially measurable: as an animating principle or vital force that gives life to organisms. It accounts for the difference between a living being and a corpse. While spirit is sometimes considered synonymous with soul, for many this latter term implies having an immortal existence—something not necessarily attributed to spirits. Many connect spirit with apparitions, ghosts, demons, sprites, or supernatural beings— with God falling in this last category. It should be noted some conceptions of spirituality, particularly those of mystics (see worldview theme #7), imagine all individual spirits interconnecting to form greater unity, oneness, Cosmic Mind, God, etc. It seems that if something can't be measured, scientists don't believe it exists. Not surprisingly they haven't found evidence of spirits since these are often thought of as the "non-physical, non-quantifiable substance or energy present in living things." In rebutting Lederman's above statement, physicist and Anglican priest John Polkinghorne suggests, "God may act in subtle ways that are hidden from physical science." doesn’t require a Creator’s purpose driven vital impulse? With respect to psychology—which originally referred to "study of the soul" but now is the nearly exclusive domain of scientific materialists—its great unsolved problem involves providing a detailed account of what human consciousness is and the mechanism by which it functions. Until scientists can do this, how can they be so sure consciousness is not what it has long been thought to be, namely "a process not a thing, held by religious tradition to reside in the soul or spirit, and identified with self awareness?" Overwhelming anecdotal evidence exists for a real spiritual presence in human beings and for events that cannot be explained using the scientific conceptual framework. Stories of prophetic dreams, the presence of ghosts, angels and super-natural beings, and legends of miracles abound throughout history. More recently, reports of thousands of people, many declared clinically dead, who survived a near death experience show an impressive consistency that cuts across cultural and religious boundaries. They include many things science can't explain. People whose perception is not restricted to what the five ordinary senses reveal but who also rely on an intuitive sense are most likely to connect with their spiritual essence. As Gary Zukav puts it, "When a multisensory personality looks inside itself, it...comes to experience the energy of its soul." Is This Really What Life is All About? The above is a map connecting tri-nucleotide sequences called codons and amino acids. 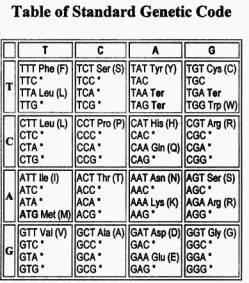 Every triplet of nucleotides (T, C, A, G) in a DNA sequence specifies a single amino acid. Produce a Complex Structure Like an Eye?